I recently scanned the QR code on a food product I bought from a brand I love. I smiled to see a picture of the farmer Juan, who grew the food I was about to eat, and his absolutely beautiful farm. But, then, I thought, what if this guy is an a**hole? All kidding aside, I love anything that connects consumers to their food — the farm, the farmer, the harvest, and the soil. And, I love that this brand used a QR code on its package to connect consumers to more information on the product. That takes money, time, and commitment to your customers and supply chain to set up. But if transparency is the purpose of the scan, which is what the brand states on its package (as do other brands that undertake this endeavor), there is a huge opportunity to do better here. After all, what did I really learn about the food in this package from this QR code scan? Let’s assume Juan really is a great guy, but maybe unbeknownst to him, he is growing his crop near an old mining dump and the soil is high in lead? Maybe he had a stressful year with weeds, and even though he is certified organic, he resorted to using using glyphosate rather than risk financial ruin? Maybe glyphosate is drifting over from the neighboring field, or is in his irrigation water? Maybe he is a subsistence farmer and used some of his organic crop to pay for his daughter’s medical bills. He filled his outstanding orders with his neighbor’s conventional crop, which was treated with glyphosate or another non-chemical like dicamba or THPI/Captan? These are all actual stories I’ve heard from other brands. And, yes, in the cases of fraud, the U.S. government should be preventing it. But they are under resourced, and this is real life. 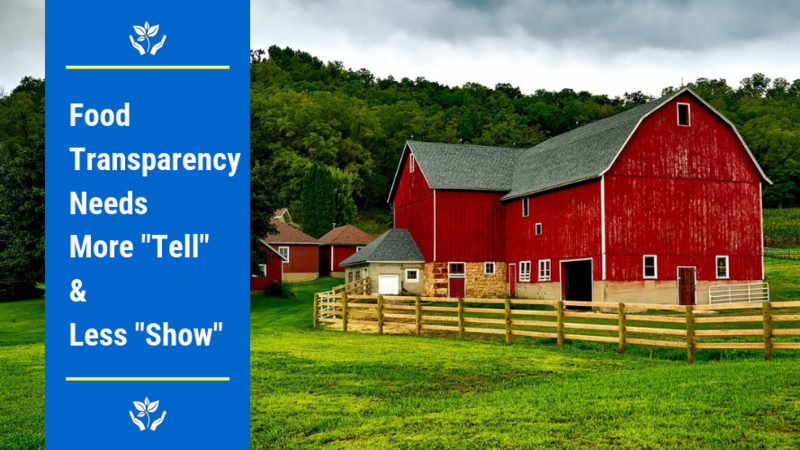 Fraud happens; life happens; knowledge is imperfect, even for the farmers themselves. One organic importer (who I would describe as being in a “high risk for fraud” commodity) told me 25% of the organic crops he imports are not actually organic, and he has to refuse them. How does he find out they aren’t organic? By testing for agricultural chemical residue. Pascha Chocolate, ZEGO’s supply partner, takes the extra step of testing their lots for heavy metal contamination proactively and ensures that its products are compliant with California’s stringent Prop 65 standards. At ZEGO we test all our products for glyphosate and over 400 pesticides, herbicides, heavy metals, allergens and gluten. Just as important, we post the results so they are easily accessible to our customers through the QR code or “T-CODE” on every ZEGO package. 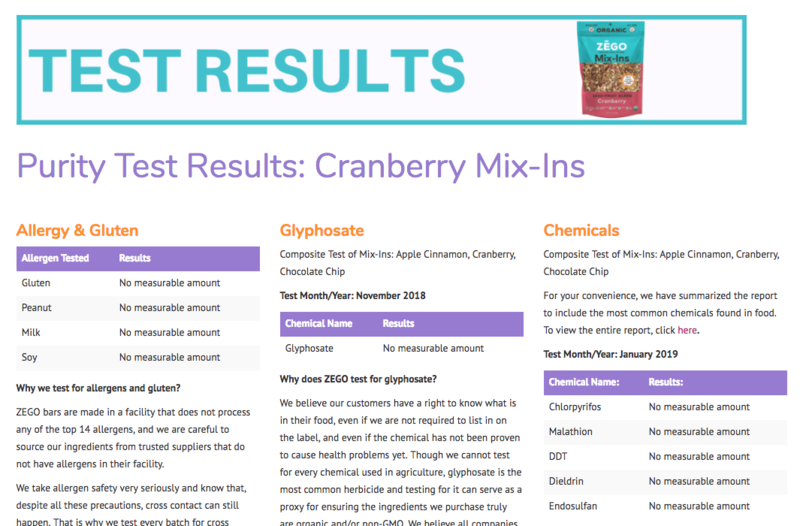 You can explore the full set of 3rd party testing data ZEGO gives consumers access to by scanning any of our products or going to our website, as an example, see this page for our Cranberry Mix-Ins (note, we perform allergy and gluten tests on each batch; chemical and metal tests are periodic). The truth of the matter is all brands should spot test to help ensure they are not passing on unacceptable levels of toxic chemicals to customers, even if they know their farmers or suppliers personally. You’d be as surprised at how many don’t as you would be at the number that do but won’t show consumers the results. Even if the chemicals are within legal limits, where legal limits exist, they may be at levels individual consumers are not comfortable adding to their diet. Consumers have a right to see purity test results for the foods they buy so they can know as much about what is in their food as possible. In our fragmented food system, there is simply no other valid proxy outside of testing that is acceptable. Here is our example of how brands can bring this the information to customers on mobile devices. To be sure, testing is still a proxy. It’s just a much better one than a picture of a farmer and a field. I am not talking about testing every lot or production run (though we do for allergens and gluten); that is not practical. It would drive the cost of the product too high. But periodic testing and, at a minimum, post-harvest testing, should be standard for all companies. What can be gained from post-harvest testing when your supplier may source from many different farms? Is that snapshot valuable? Yes, I can tell you from personal experience. But that is a subject for my next post, on raspberries. So, YES, please do introduce me to the farmer. I love that. Now, could I see your latest test results for pesticides, herbicides, and heavy metals for this product? That would give me true Peace of Mind. Colleen Kavanagh is the founder and CEO of ZEGO. After a career in public policy working to improve nutrition for low-income children, she started ZEGO, combining the ultimate in taste and transparency to create nourishing food so all people can thrive, regardless of dietary restrictions. ZEGO is certified as a B Corporation and Woman Owned (WBENC) and is working to bring transparency to the supply chain to improve food safety and nutrition for all. ZEGO products are gluten free, allergy friendly (top 12 allergen free facility), non GMO, and glyphosate free. Below is a list of all 400+ chemicals ZEGO is currently testing for.